Successfully Added Xiaomi Redmi Note 3 Pro - Snapdragon 650 CPU, 2GB RAM, Adreno GPU, Fingerprint Scanner, 16MP Camera (Silver) to your Shopping Cart. The Xiaomi Redmi Note 3 is a stunning all-metal phone that's available in a 2GB RAM and 16GB memory format making it more affordable than the 3GB + 32GB version, but no less beautiful. This fantastic little stunner comes from China's answer to Apple. The Redmi Note 3 is the darling of their budget lineup, and rightfully so as it has a fantastic design and fairly impressive performance. Under the silky smooth metallic outer is a Qualcomm Snapdragon 650 64bit CPU that reaches 1.8GHz so when put beside the 2GB of RAM brings a slick performance. couple that with a 5.5 inch display that boasts 403 pixels per inch and you have a powerful phablet that packs in some top end features. A fingerprint scanner takes pride of place on the rear of this devices providing secure access so you can keep out unwanted users. Above that is the mesmerizing 16MP rear camera with which you can capture stunning photos and full HD video, there is even a great flash there so low light and night time shots will be picture perfect. With dual SIM card support the phone lets you switch between SIM cards without having to remove them or alternatively you can fill the second slot with 1285GB of extra storage should the 16GB of internal memory not be sufficient. Having a 4000mAh battery on such a slim phone is a real treat and just as well for now you can enjoy many hours of fun from every charge so you can make the most of this stunning phablet every day. 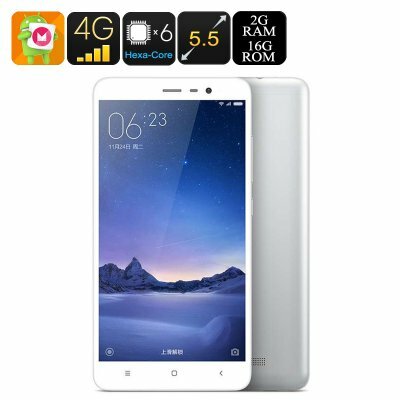 The Xiaomi Redmi Note 3 Smartphone comes with a 12 months warranty, brought to you by the leader in electronic devices as well as wholesale Android phones..